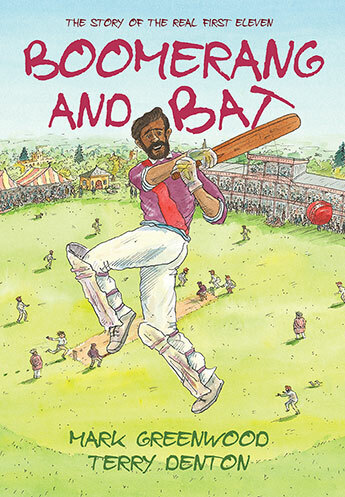 Told in narrative form, Boomerang and Bat shares the true story of the first Australian cricket team to tour England, and it’s an important story to remember. In 1868, an Aboriginal Eleven made a name for themselves playing cricket in Melbourne. They caught the notice of an English player, Charles Lawrence, who proposed they tour England. They were refused permission to leave Australia, but defied the authorities and eventually began a long and roundabout journey through the outback and across the sea. Boomerang and Bat tells how these events came about, and follows the cricketers, led by Johnny Mullagh, as they play matches all over England. Just like back home, the team is a rousing success, even playing at Lord’s Cricket Ground. However, despite their success the players were not treated particularly well and were subjected to racism. When illness hit the team, and lead to the death of one of the players (Bripumyarrimin, King Cole, to whom the book is dedicated), the men decided they had had enough, had been away from home for too long, and set off on the journey back to Australia. At home, there was no recognition of their achievements and they mostly returned to obscurity. Mark Greenwood and Terry Denton have teamed up to tell this story which is an important part of our history. As outlined in a set of comprehensive teacher’s notes, it’s a good tool for exploring themes such as indigenous culture, identity and history, as well as sporting history, national heroes and Australian identity. 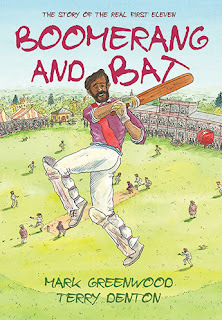 Visually, there is also a lot for readers to uncover as they read Boomerang and Bat, including the endpapers which show a map of the journey taken from Australia to England, and the team that played, listing their names and describing their skills (on and off the field). Boomerang and Bat is a highly recommended story for children and adults.